This lovely hill top cabin features a spectacular view! 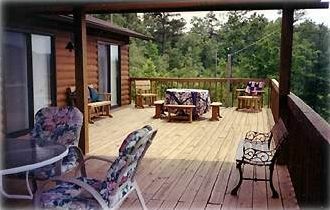 Enjoy the comfort of a spacious covered deck 'rain or shine,' looking at the wonderful view. This cabin features a large master bedroom with a king size bed and private bath. The guest room has a full size bed and two bunk beds and a bath off the hall. the kitchen is well equipped with everything one needs to prepare a nice meal. A water treatment filtering system is also in place. There is a large selection of videos for your enjoyment. Access from the home is a paved road with a small section of gravel at the top. Pets are NOT allowed, Smoking on Deck Only. Our area takes pride in the John C. Campbell Folk School which offers classes from blacksmithing to broom making and weekly concerts. Festivals, flea markets, and the Brasstown Antique Village will surely keep you busy. Grocery stores, restaurants, hospitals, and scenic highways are only minutes away. Murphy is within a days excursion of the Cherokee Indian Reservation, Asheville with the Biltmore Estates, Gatlinburg/Pigeon Forge, and Dollywood. Wonderful place, great location, beautiful views of the mountains. We love this sweet cabin. Beautifully decorated, very comfortable, located close to so many wonderful places to visit but when your in the cabin it’s quiet and peaceful. We love to cook and they had a great kitchen with lots of prep space. The porch is awesome and we spent most evenings out there watching the sun go down over the mountains while a flock of wild turkeys wandered around the back of the cabin in the evening. We also saw deer along the edge of the woods below the porch. The town of Murphy is great with things to see and fun places to eat like ShoeBooties & Rib Country. We visited Tellico Plains where we did the skyway drive which was gorgeous during the fall and saw waterfalls along the way. We also visited Fields of the Wood, Blairsville, Brasstown Bald, the town of Blue Ridge and Mercier's Orchard. We drove over to Bryson City and did the train ride to Dillsboro. All of these places are a reasonable drive from the cabin. On our particular trip we were traveling with older parents and needed a hospital. The cabin is located very close to Erlanger Murphy Hospital which is a great little hospital. I can’t tell you how well we were treated and the staff took such good of my father. I would strongly recommend this cabin for anybody who is looking to get away. We had a chance to meet the owners of the cabin and they are absolutely wonderful people. We would love to return to this cabin one day. We arrived on check-in day and were met by the owner who graciously had everything ready to move-in. As Floridians, we were glad to stay in a quaint, homey cabin in NC to escape the FL summer heat for 4 wks. Every morning and night the cool mountain air out on the back deck made the mountain view even better. The cabin was very comfortable, but the owners (who live next door) made the stay very pleasant and we felt at home throughout our time in NC. My husband and I and a good friend stayed at Cardinal Place to watch the total eclipse and could not have asked for a better experience. The cabin is isolated enough to enjoy its amazing views, peaceful days, dark nights and glimpses of wildlife yet close enough to town to reach a number of restaurants, shopping, and historical Murphy within minutes. The kitchen was well-stocked, the beds were comfortable, and the porch was plenty big, with both a covered and uncovered section. We did a lot of porch sitting while we were there. The Wrights are sweet people, easy to talk to, and wanted to make sure our stay was wonderful. I can easily recommend the Cardinal Place to anyone wanting a mountain getaway. We really enjoyed our stay. The house was very comfortable. Mr. And Mrs. Wright were great hosts. We really enjoyed our stay. The house was very comfortable and convenient to the river rafting. Mr. And Mrs. Wright were great hosts. We rented this place for a quick getaway. Our only regret was that it was so quick. This place is absolutely beautiful. The view from the covered deck is just breathtaking. While we were only there two days we spent one day sightseeing. We visited Fields of the Woods and Fire Creek Falls. There is a wide variety of restaurants in the area. We left to go to one, which was no longer in business, but found Murphy's Chophouse which was very good. There are also wild turkey that you see all day and deer that come up at night. The owner's are the sweetest people. You can tell that they take great pride in this home. Literally the only thing you need to bring is your clothes. Shopping is close by for anything you may want. We loved everything about this place , and the sweet people who own it, it is A little heaven on earth, this was our second time there, and we stayed 11 days this time it was perfect.